Harry Morgan, M*A*S*H's Col. Potter, Dies At 96 Harry Morgan played one of television's most beloved commanding officers. As Col. Sherman Potter, he brought an avuncular authority to a show about the absurdities and horror of war. M*A*S*H costar Mike Farrell said he died Wednesday peacefully in his sleep. Col. Sherman Potter (Harry Morgan) was a father figure to Cpl. Radar O'Reilly (Gary Burghoff). One of television's most beloved commanding officers died Wednesday. 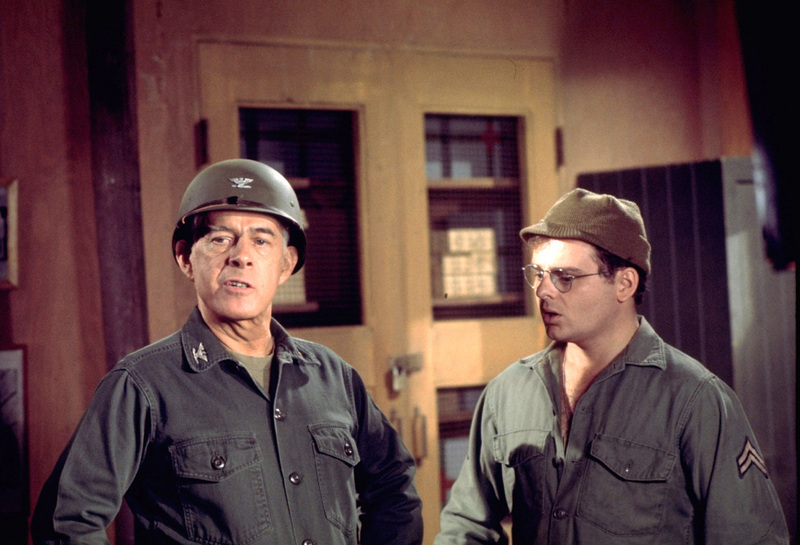 Harry Morgan, who played Col. Sherman Potter on M*A*S*H, brought an avuncular authority to a show about the absurdities and horrors of war. He was 96. M*A*S*H, a sitcom about an Army medical unit during the Korean War, was one of the best satires on television. As doctors cracked wise, it was often Morgan's character who provided the moral outrage. "Every month there's a new procedure we have to learn because somebody's come up with an even better way to mutilate the human body," Potter said in one episode. "Tell me this, captain, how the hell am I supposed to keep up with it? If they can invent better ways to kill each other, why can't they invent a way to end this stupid war?" Potter was decent, sympathetic and embodied a kind of folksy middle-American sensibility. "He just seemed and carried himself like the last reasonable man in the middle of craziness," said James Poniwozik, television critic for Time magazine. In 1983, Morgan spoke at a press conference about ending a series so beloved that the last show drew a record 125 million viewers. He said someone had asked him if he thought M*A*S*H had made him a better actor. "And I said I didn't know about that, but I know it's made me a better human being and there aren't many shows you can say that about," he said. Morgan alluded to his long career as a character actor, performing on Broadway, in movies and on the TV show Dragnet before he got cast in M*A*S*H during its fourth season. "I've done about a hundred movies plus and this is my eighth television series, and believe me in my experience there's never been a congregation of actors put together that would come within a mile of this bunch," he said, trying to hold back tears. "And I'm gonna miss them very much." Jamie Farr, who played the cross-dressing company clerk, Cpl. Max Klinger, said that even in a cast filled with cutups, Morgan was infamous for being funny. "He was terrible; he was absolutely the worst," Farr said, affectionately. "I wish you could see some of the outtakes; we had some great ones." Farr said he spent most of Wednesday exchanging emails and phone calls with members of the cast. He said Mike Farrell, who played B.J. Hunnicutt, was a huge presence in Morgan's last days; he kept everyone updated from the hospice with emails. The last one he sent Wednesday said Morgan had died around 3 a.m., peacefully and in his sleep.